One of our goals at Fairytale Piano Academy is to help piano students LOVE playing the piano from the very beginning. That means practice time should never seem like a chore. Now don’t get us wrong, piano practice requires discipline. 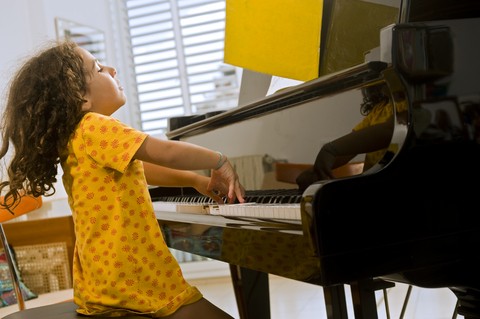 Just like you don’t let your kids skip brushing their teeth, we don’t want kids skipping a day of practicing just because they “don’t feel like it.” Read on for some suggestions to help your piano student look forward to practice time every day. Keep it short and sweet. End the practice session before your piano student gets tired. As a rule of thumb, students in the first few lessons should be practicing about ten to fifteen minutes per day, and slowly work up to thirty minutes a day as they are able. By keeping practice sessions short and sweet, your child will be more willing to come back the next day for more. Positive attitude. This is important for both the piano student and the practice partner. Never scold or threaten to get your piano student to the bench. If they complain, remind them to come to piano practice with a smile. You might even want to make a game out of cheerfully coming to practice (see no. 3). Use piano practice games. 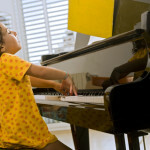 Children love games, and when it comes to piano practice there are lots of ways to have fun and be creative. A good practice time game will have a clear and specific goal with results attached, but within those guidelines, your imagination is the only limit. To create a great piano practice game, first decide what you’d like to target, such as piano posture, or playing a song without missing any notes. Then choose a clear, specific goal that’s attainable for your child. If hand position is the issue you’d like to tackle, make the object of the game to keep fingers curved and relaxed, and don’t worry about anything else. Next, decide how you’re going to give feedback. One fun way to do this is to have a small object like a toy or a coin set near one end of the keyboard, and move the object one key closer to the end every time the child succeeds. Make up a story about the object that your child will enjoy, such as a prisoner trying to escape from a dungeon, or a lost pet finding its way home. Practice Charts: One very common game is to use a practice chart for a piano student to mark during each practice session. Decide what you’d like to track and improve, such as cheerful attitude or how many minutes spent at the piano. For many children, just tracking their progress is reward enough, but you may want to offer a favorite activity or treat when your child has reached certain practice time goals. Roll-the-Dice: Another game I’ve started using recently involves an element of chance. The piano student rolls a six-sided dice to see how many times to play a song or portion of a song. If the student plays correctly, turn the dice so that the next lower number is facing up. For instance, if the piano student rolls a four, then plays correctly, the die is turned so that three is facing up, then play again, and so on down to one. Penalties: If a piano student’s playing is getting careless, don’t be afraid to use penalties in the game, such as moving the object on the keyboard further away from the end as a consequence for a missed note. Penalties should never be used when students are learning new songs, only when those songs have been learned and are ready to be mastered. Most students smile when I give them their first penalty, and it spurs them on to better quality of performance. Above all, games should be positive. Don’t set objectives too high. Children will enjoy games most if they can be successful 85% of the time or more. Use your imagination, be creative, and find out what clicks for your piano student.